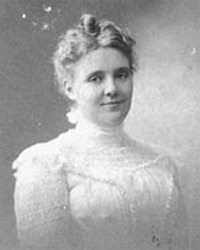 Dr Ida Sophia Scudder an American Medical Missionary in India belongs Reformed Church in America, was born on 09th December 1870 to Dr. John Scudder Jr. and Sophia, part of a long line of medical missionaries. 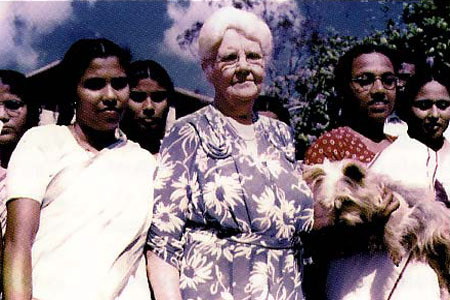 The granddaughter of John Scudder, Sr., as a child in India, she witnessed the famine, poverty and disease in India. She was invited by Dwight Moody to study at his Northfield Seminary in Massachusetts, where she earned a reputation for pranks. She dedicated her life to the plight of Indian women and the fight against bubonic plague, cholera and leprosy. 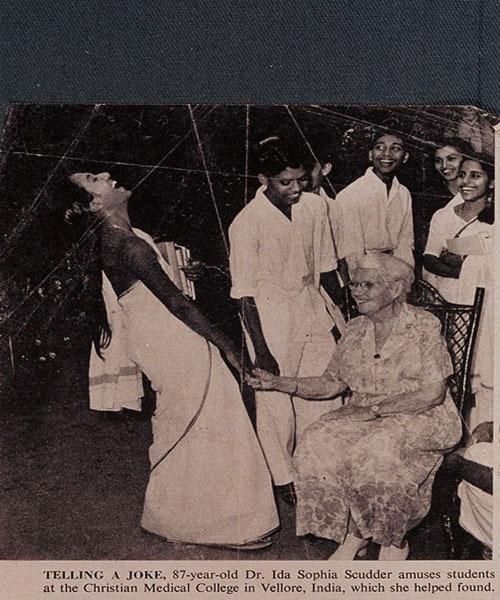 She initially expected to get married and settle down in the United States after seminary, but in 1890, she went back to India to help her father when her mother was ailing at the mission bungalow at Tindivanam in Tamilnadu. She had expressed a resolve not to become a medical missionary, but during that stay, she had the enlightening experience of not being able to help three women in childbirth who died needlessly in one night. 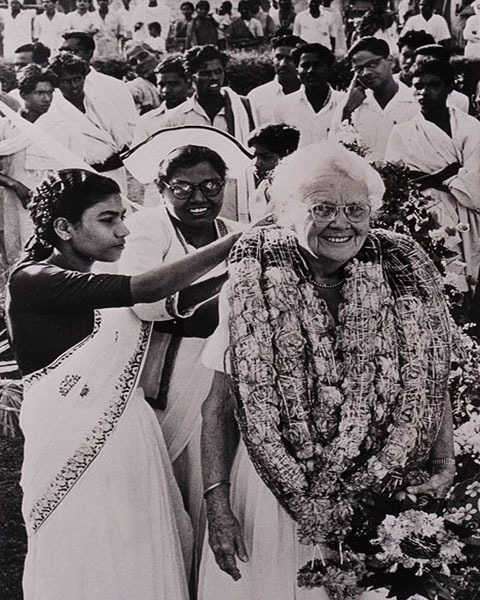 That experience convinced her and she believed that it was a calling and a challenge set before her by GOD to begin a ministry dedicated to the health needs of the people of India, particularly women and children. She never married. 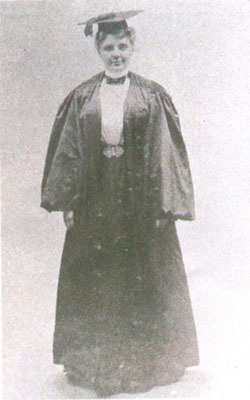 Consequently, Ida went back to America, entered medical training at Cornell Medical College, New York City and in 1899, was one of the first women graduates of the Weill Medical College of Cornell University, which accepted women as medical students. She then headed back to India, fortified with a $10,000 grant from a Mr. Schell, a Manhattan banker, in memory of his wife. Shortly thereafter, she returned to India and opened a one-bed clinic (tiny medical dispensary) for women in Vellore in Tamilnadu, India, 75 miles from Madras, state capital of Tamilnadu, in 1900. Soon after her arrival in India, her father died in 1900. Within two years, she treated 5,000 patients and in 1902, she opened the Mary Taber Schell Memorial Hospital with 40 beds. She realized that she would be foolish to go on alone in her fight to bring better health to South India's women, so she decided to open a medical school for girls. Skeptical males said she would be lucky to get three applicants; actually she had 151 the first year (1918), and had to turn many away ever since. At first, the Reformed Church in America was the main backer of the Vellore school, but after Dr.Scudder agreed to make it coeducational, it eventually gained the support of 40 missions. Of 242 students today, 95 are men. In 1903, she started first training course for compounders and in 1906, “Roadside clinics” outreach to villages using bullock cards was began. 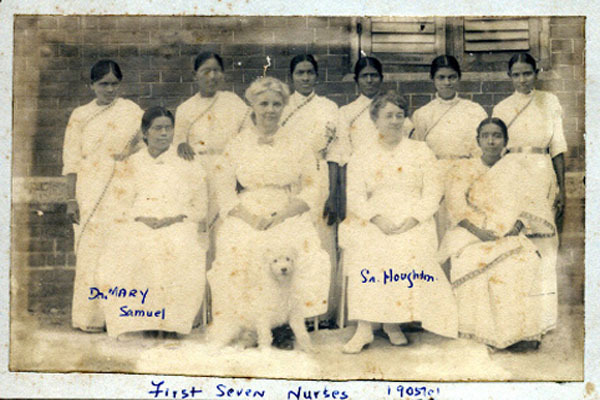 In 1909, she started the School of Nursing with Diploma course and in 1918 she started one of Asia's foremost teaching medical school for women was opened under the name Missionary Medical School for Women with the course of Licensed Medical Practitioner Course. In addition to the medical and nursing schools that she founded, Dr. Ida frequented outlying villages and started a roadside dispensary in 1916. Over the years, these roadside dispensaries were upgraded into rural health and development programs. 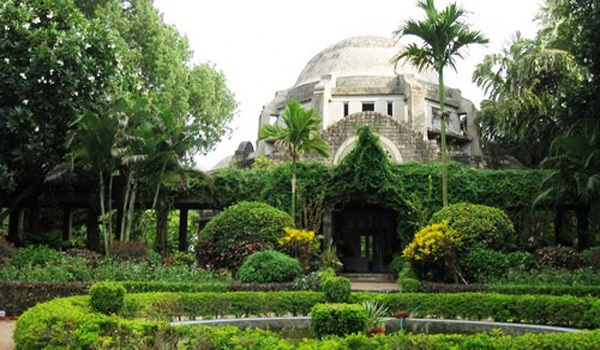 In 1924, she opened on present site in Thottapalayam, Vellore. In 1928, ground was broken for the "Hillsite" medical school campus on 200 acres, about 8 kilometers West of Vellore. 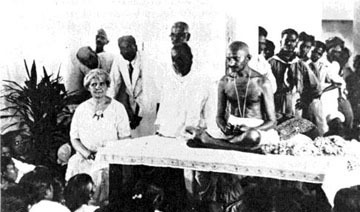 In 1928, Mahatma Gandhi visited the medical school. She traveled a number of times to the United States to raise funds for the college and hospital, raising a total in the millions. The medical school was upgraded into a university affiliated medical college granting the degree of M.B.B.S in 1942, under the name Christian Medical College. In 1946 Nursing College was opened, which was the India’s first, offering degree course. Men were admitted to this college in 1947, ten in a class of 35. In 1948, first reconstructive surgery on leprosy patients in the world and first Eye camps organised; first Neurological Sciences in South Asia and in 1950, medical postgraduate courses were started. 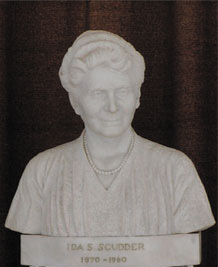 In 1953, when she was 82 years old, she was presented with the Elizabeth Blackwell Citation of the New York Infirmary as one of five outstanding women doctors of 1952. She was at "Hilltop", her bungalow at Kodaikanal, which overlooked Vellore's Christian Medical College and its hospital and opened a stack of letters and telegrams. Her name is a famous one in India. A letter once reached her addressed simply, "Dr. Ida, India." But the mail was heavier than usual because friends around the world were congratulating her on winning the Elizabeth Blackwell Citation from the New York Eye and Ear Infirmary, as one of 1952's five outstanding women doctors. After tireless service to the Indian people, Ida died at her home on Hilltop, a bungalow at Kodaikanal, on 24th May 1960 at 89 years old. The girl who promised she would never set foot in India again, served there until the day she died. Ida Scudder is a wonderful example to the people of compassion and courage. She had her mind made up to a normal life of marriage and children, but was faithful to respond to God when GOD impressed her with the need of the women in India. How many of people will give up even a couple of month and send some money to a mission, let alone travel to a place where there is only hardship and suffering and dying. She is an encouragement to the people to think of others. We might feel that we can’t do much in our own small corner in our world, but with a vision to help others, and God’s help, we can really do much to brighten the lives of others around us. A stamp issued on 12th August 2000, as part of centenary celebrations of Christian Medical College, depicts the college chapel, the motivating monument of the medical college and hospital symbolizing the ethos of the institution. The First-day cover portrays Dr Ida Scudder, who founded the institute in 1900, working for the medical requirements of pregnant women. The hospital now caters to 5500 outpatients, 2500 inpatients, 75 surgical procedures, 22 clinics and about 30 births every day. Community Health and Development (CHAD), College of Nursing Community Health (CONCH) and the Rural Unit for Health and Social Affairs (RUHSA) workers go to the villages and rural areas to raise awareness of disease prevention, health care and community empowerment. Each year 60 students, of which at least 25 are women, are admitted for the undergraduate medical course. 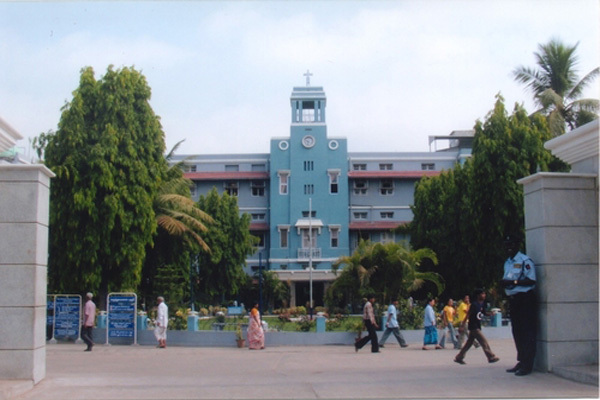 In 2003, the Vellore Christian Medical Center was the largest Christian hospital in the world with 2000 beds and its medical school is now one of the premier medical colleges in India.